Saw the truffle recipe from the latest issue of Bon Appetit. Surprisingly easy to make, but very messy. Long waiting time though. Simmer cream in small saucepan. Remove from heat, cool to lukewarm, ~ 10 min. Add in cream, stir well. Chill truffle base until firm enough to roll, 3+ hours. Line rimmed baking sheet with waxed paper. Roll 2 tsp. truffle base (or use a melon baller) between fingertips into ball. Transfer to wax paper, chill until firm, ~ 1 hour. Line another baking sheet with wax paper. Melt 8 ounces of chocolate in another sauce pan; remove from heat, and cool slightly. Scoop some of this warm (not hot) chocolate into palm of hand. 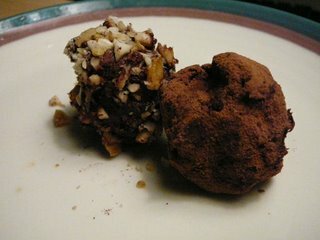 Place 1 chilled truffle base ball into hand, roll in palm, and coat with melted chocolate. Roll in cocoa powder and/or other toppings if desired. Chill until firm, ~ 1 hour. Can be made up to 1 week in advance. Store in airtight container and keep chilled. 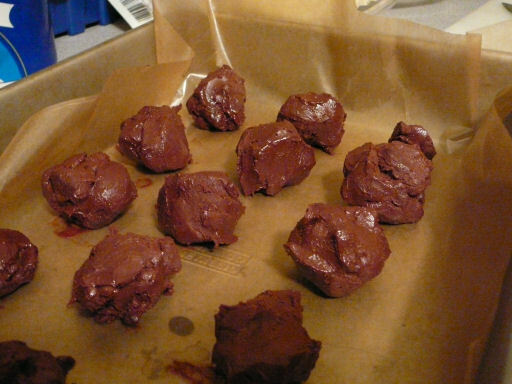 Not a glamorous shot here, since they look like turds, but here is the truffle base after being chilled for 3 hours. The slightest amount of warmth from my hand instantly melted them, making it hard to properly mold them, even with the aid of a melon baller. I would advise chilling them for at least 4 hours, and molding them with the fingertips (which are cooler), rather than the palm of the hand. After being sufficiently chilled, they're coated with an outside layer of 60% dark chocolate. For toppings, one is almonds and walnuts (wish I had some hazelnuts on hand), and the other is Polain 1848 60% dark cocoa powder. I'll try and make a white chocolate base next time with dark chocolate layers.